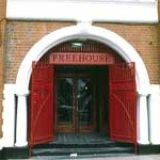 The Half Moon pub is a Wetherspoons that offers a choice of beers, wines and sprits. There is also an array of pub snacks available. Do you work at Half Moon? What did you think of Half Moon? Students and Wetherspoon pubs – if ever there was a match made in heaven, this is it. The Half Moon is located a stone’s throw from the sprawling Queen Mary University of London campus and as such, is inundated with a constant stream of custom. 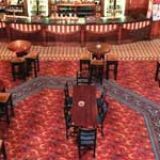 Wetherspoon pubs tend to have certain attributes in common: they are large, they have great toilets (seriously) and they have ugly carpets sat beneath slightly sticky tables. Half Moon ticks all of these boxes. Located on Mile End Road at the Stepney Green end of this long street, Half Moon is set back slightly from the main road thanks to a large terraced area to the front, which is incredibly popular on rare sunny days. Inside, it’s typical of Wetherspoon’s with heavy wooden tables everywhere you look, those God-awful carpets and a sprawling bar covered in students. Standard. Half Moon is great if you’re young – it’s always filled to the rafters with students whatever time of the day it is, and it has a buzzy atmosphere as 18- to 21-year-olds get tanked up ahead of a long night of par-tay-ing. If you’re over the age of 30 you can pretend you’re at the zoo and watch as the male students try to entice the female students with cheap drinks and cheesy chat-up lines. It’s all in good humour though and it doesn’t feel too much like a meat market, even at prime time on a Saturday evening. Sticky laminated menus sit atop the even stickier tables and display an array of colourful pictures of lasagnes and burgers – just in case you forgot what they looked like. Prices of food at Wetherspoon’s have increased in line with rising food costs over recent years but they are still competitive with main meals edging around £10. That said, it’s worth checking out the meal deals – very popular among the student population – for cheap curries, steak nights and burger and pint offers, which bring that price down by a couple of quid. 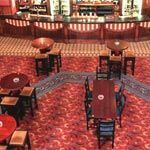 While students see Wetherspoon pubs like the Half Moon as cheap places to get tanked up ahead of a night out clubbing, in beer circles they are widely regarded to be worthy of respect thanks to their dedication to real ale. CAMRA-recognised, the Half Moon keeps its selection of weak commercial lagers (Carlsberg, Fosters and co) but mixes it up with real ale on tap. Think Greene King IPA, Well’s Bombardier, Jenning’s Sneck Lifter and Sadler’s Hop Bomb and you get the idea. If you’re adventurous, they are well worth checking out. Half Moon has been a student hangout for well over a decade and with good reason. Even when busy you can usually get a table, there is always plenty of reasonably priced beer to choose from and the food is cheap(ish), too. The Half Moon isn't sophisticated or in a particularly trendy area, but it's one of the better Wetherspoons I've been to - close to the tube, cheap drinks of course, good staff, can be a bit full of students as its right by Queen Mary's but normally is fine. Go there if you're looking for cheap drinks with your mates and you won't be disappointed! I go there every week! Service was terrible when we visited on The Half Moon Theatre on Sunday. We waited 50 minutes for 2 meals when groups were served quicker. When the food did finally arrive it was cold and dry and completely uneatable. I would avoid the Half Moon Theatre at all costs.